- Tangled Threads -: Bluebirds and frogs....what a combination! With it being wet and miserable outside, I think the frogs decided to move in with me so they could stay nice and warm.....let's hope they decide to move out quickly as I've had enough of them! I'm hoping that the frogs have finally got the message that they're not welcome and that they've moved out! Good luck with those frogs moving out and staying out! LOL I think your blue birds will be a wonderful piece. There are so many different colors of blue's...it must be hard to not make a mistake. Keep going you are doing great. That is very frustrating but the final picture is sure looking beautiful. Hopefully the frogs leave this piece alone now. but for now---I will probably leave it as it doesn't affect the rest of the sampler--but--grrrrrrrrrrrr!!!!! Yep I redid my crochet the other night. ... one whole nights work gone! Oh well we do what we can. Still a lot of progress. I think we all hate the frog. Love the blue birds. Happy stitching! I wish the villainous frogs don't bother you now. I had many instances where I just got half an hour in a day to stitch only to find next day that I need to frog all that. Once I had posted my negative progress too when it was quite a big chunk that had to be erased. Your work looks beautiful even with frogs. It has been raining for two days here, and I think it attracted the frogs out of hiding! I found a mistake in my work, and when I realized I need to pull out everything I stitched this morning, I just put it away until tomorrow. 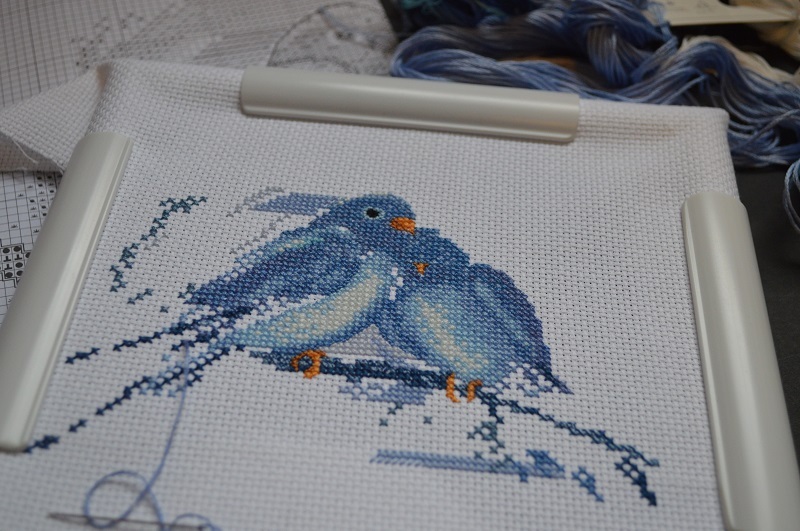 Your piece is coming along so nicely! I love the shades of blues. Hi Rhona, yes I know that too and I am also annoyed with my mistakes, but then I'm glad when everything is corrected again and the motives look beautiful. It's the worst part of our hobby!...unless you make it into a game. 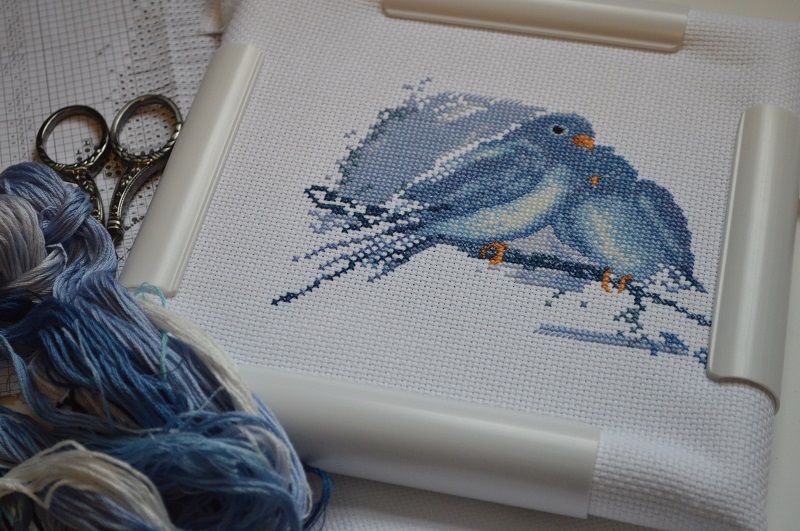 I read years ago in a magazine column by a former MP turned stitcher here in the UK, that whenever he had to unlock anything he pretended to himself that he was working at the Royal School of Needlework restoring an antique sampler! I've never forgotten it and it does make frothing a bit less painful! Having said that, please don't send them my way.